Located just outside of Kansas City, Missouri. Founded in 2007 by professional guide Larry Vaughan, the Rippertail Lure was his answer to durability issues as well as the limited action that many baits offered. Originally Rippertail Lures were a solid body with a corrugated and tapered tail poured in Larry’s garage for personal use. In 2010, after numerous requests, Larry decided to make his lure available to the public and started distributing them to local Truman Lake Reservoir Bait Shops! After a few years and as many subtle improvements, Larry reached the sleek, effective, tangle free Rippertail Lure we offer today! In 2014, cousins Mike and Bryan purchased Rippertail Lures in an effort to take what Larry had built to the next level and offer Rippertail Lures nationwide, both online and through our many reputable dealers! 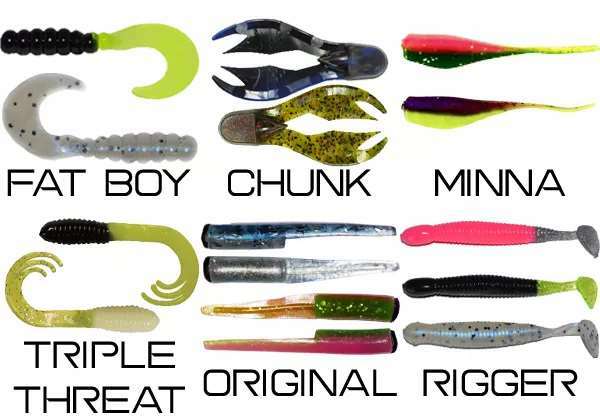 Proudly manufactured in the USA, Rippertail Lures are constructed with the finest soft-plastics using the latest injection molding technology in the industry! It is our goal to provide high quality products with you, the fisherman, in mind! Rippertail Lures is proud to announce that we have officially been verified through the VA as a Service-Disabled Veteran-Owned Small Business! We hope this will allow us to get our products into new places to help other active, retired and discharged veterans have success on the water! Along with opening new doors and opportunities to continue to provide you all with the great quality products you have come to expect and love from our company! None of what we do everyday could be possible without all of our fans and customers! You all have shown such great support, and a continued flow of business! Mike and Bryan will continue to live out our dream and always working hard with you the fisherman in mind! Have a great rest of your week! KEEP THOSE LINES TIGHT! As you will see, Rippertail Lures is growing! In addition to the Original Rippertail, we are proud to introduce the Rippertail Minna’, the Rippertail Fat Boy, the Rippertail Triple Threat, the Rippertail Rigger, and the Rippertail Chunk! We are working every single day with you, the fisherman, in mind to provide some of the best products in the industry! In doing so, we have partnered with Denali Rods and are proud to offer their full line of rods! We are having a blast living out this life long dream, but it wouldn’t be possible without YOU! We appreciate each and every single one of you and will continue working to provide you with the best products in the industry! We Thank you for your business! Now, go catch some fish and tell us about it!